History and causes of the Balkan campaign 1940-41. 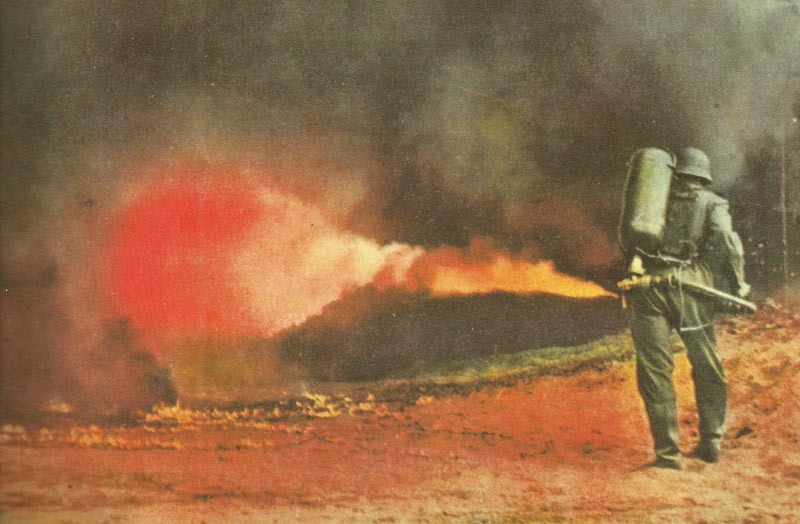 German flamethrower in action against the Greek Metaxas Line. 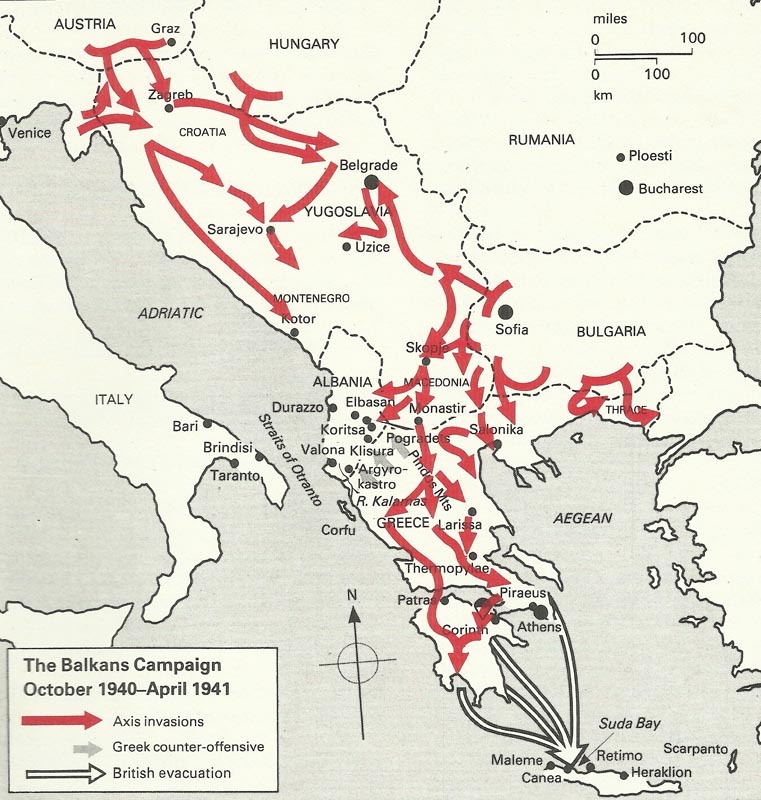 The Balkans Campaign October 1940 – May 1941 (capture of Crete). End of October 1940, Hitler ended his Western Journey. The conversation with the Spanish leader Franco has been inconclusive, as well as a meeting with the new French leader Marshal Petain and his cunning Prime Minister Pierre Laval. What the French politicians were hoping, is a tolerable peace for France, at least the early release of prisoners. This would probably have agreed – with regard to the assault of Oran – to mobilize the French navy in the Mediterranean for the German-Italian warfare by the Fleet Commander Admiral Darlan. But Hitler has no real idea of ‘peace in Europe’ and doesn’t make any concessions. On the way back Hitler achieved the message that Italy had attacked Greece on October 28, 1940. He is beside himself. Nothing comes to him less concerned, as this step. Mussolini triumphs. Always has Hitler made to him a fait accompli, in the case of Austria, Czechoslovakia, Poland, Denmark and Norway, in France, Belgium and Holland. Now he is charged back – the Duce to the Fuehrer – in the same way. 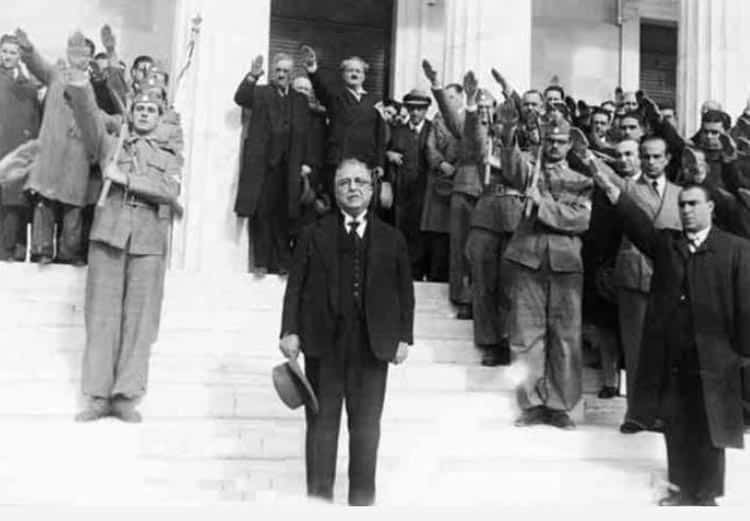 The Greek dictator Metaxas, surrounded by follower showing the ‘fascist salute’. The Italian offensive from Albania – at the dawn of winter and through the mountains – against Epirus breaks down within a few days. The Greek army makes fierce resistance. The military regime of General Metaxas, set up by King George II, has outspoken sympathy for the Nazi movement in Germany. Many Greeks admired Hitler. But the hatred against the Italians, however, is deeply rooted since the days of Venetian rule at the end of the Middle Ages in many parts of Greece. In November 1940, the Greek troops of Epirus starting with a counter-offensive, parts of the Italian troops flee. Koritza in Albania was conquered by the Greeks. A tragedy is becoming apparent. Yet on October 29, 1940, British troops from Egypt beginning with occupation of the island of Crete as a precaution and are informing the government in Athens about it. Despite all his sympathy of the king of England, General Metaxas temporary rejects an offer of British troops to help against Italy. This may resulted in a clash with Nazi Germany and this he wants to avoid. The Duce is currently fully winner pride. His army is still standing on the border of Western Egypt, still holds the Italian Bastion in East Africa under the Duke of Savoy-Aosta. A hastily requested meeting by Hitler in Florence remains without result. 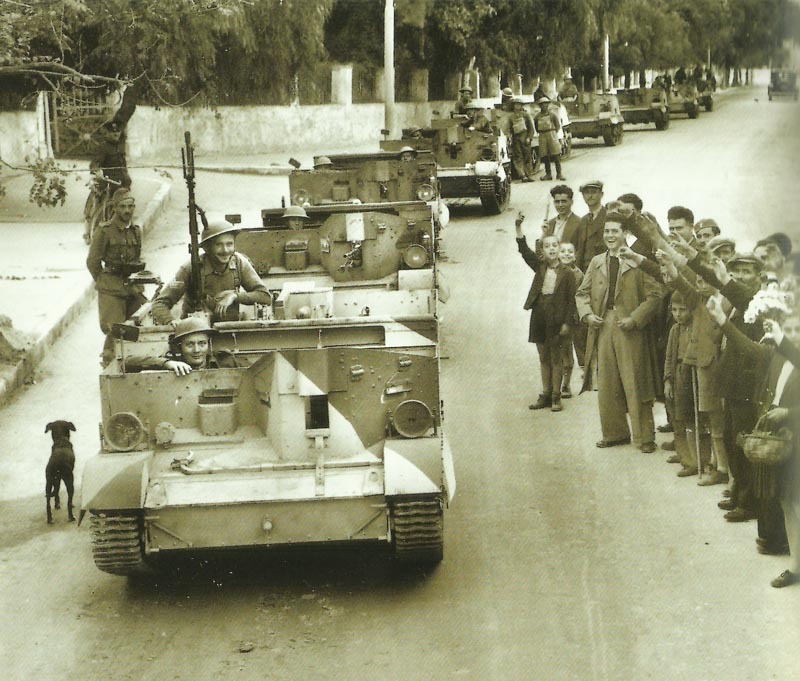 British motorized troops at the entrance to Chania in Crete in October 1940. Given the British measures – the occupation of Crete – Hitler arranged on 4 November 1940 preparations for a German attack on Greece to relieve the Italians in Albania. Anyway, in the southeast everything is not exactly encouraging. Stalin uses coolly Hitler’s commitment in the West, although he was deeply impressed about the tremendously rapid victory over France, that he has held for much stronger and with whom he was allied since 1935. During his movement of restoration of tsarist territory, the already small republics of Estonia, Latvia and Lithuania have fallen victim to Stalin. In the next step he compels the after World War One arise Greater Romanian Kingdom to hand over Bessarabia and the Northern Bukovina. The throne of the Hohenzollern in Romania is in danger. King Carol II is calling General Antonescu as a dictator on September 4, 1940, resigns two days later in favor of his young son Michael I and leaves along with courtiers the country. Despite his French General Staff training, Antonescu is a man who in this situation decided to Germany. Meanwhile, in view of the new development, Greece accepts British troops to help. Beginning in March 1941 British units land in Piraeus, the port of Athens and Volos, which results in a fatal weakening of the British fighting strength in Egypt and Libya. 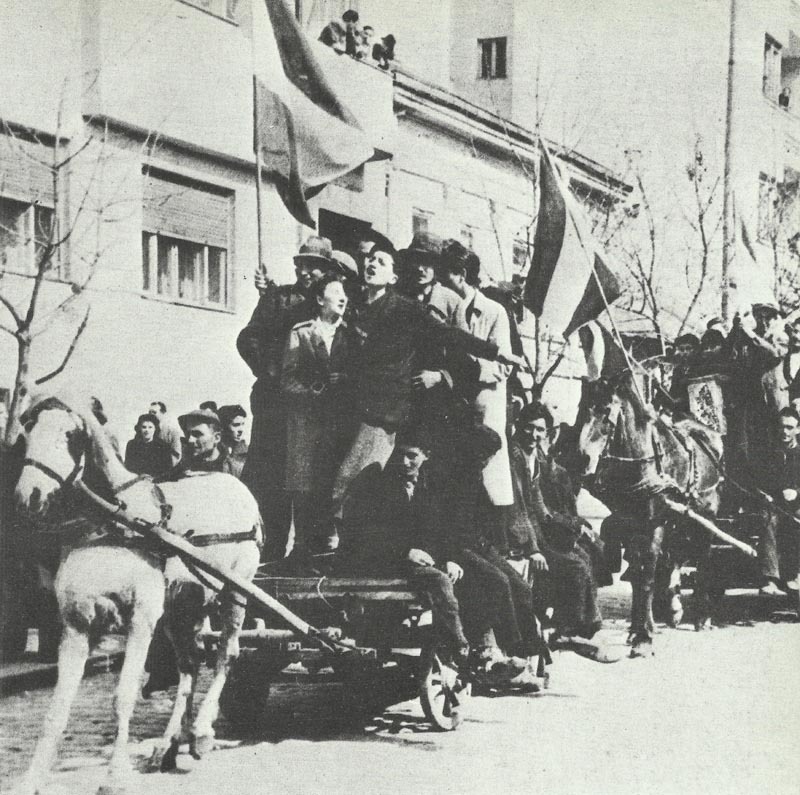 Serbs celebrate in Belgrade the overthrow of the government after joining the Tripartite Pact. The Serbian officers, anti-German since the Habsburg days, mutinied under the leadership of the Air Force chief General Simovic. The Prince Regent and the government are arrested, proclaiming the almost 18-year-old Peter King of the Serbs, Croats and Slovenes. The Prince, now King Peter II, has tears in his eyes. The new government annulled the accession to Tripartite Pact. General Simovic and the Serbian officer corps, which sees itself as a guardian of a tradition Greater Serbian national state, calculate incorrectly. Hitler reacts instantly, now already nervous because of the huge parade for Operation Barbarossa in the East is already well advanced. His chief of staff, the ‘teacher’ General Halder accomplishes a sparkler, which identifies him as the last great German Chief of General Staff: The improvisation of the lightning German deployment against Yugoslavia and Greece, as required by his Führer. From the outset the military situation is precarious for Yugoslavia. In his deep east flank the German 12th Army under Field Marshal Wilhelm List is standing in Bulgaria. From the north Halder deploys the 2nd Army under Colonel Maximilian Freiherr v Weichs against Croatia. Attack by Ju 87 Stukas on the barracks of the Yugoslav Guard in Belgrade on the morning of April 6, 1941. 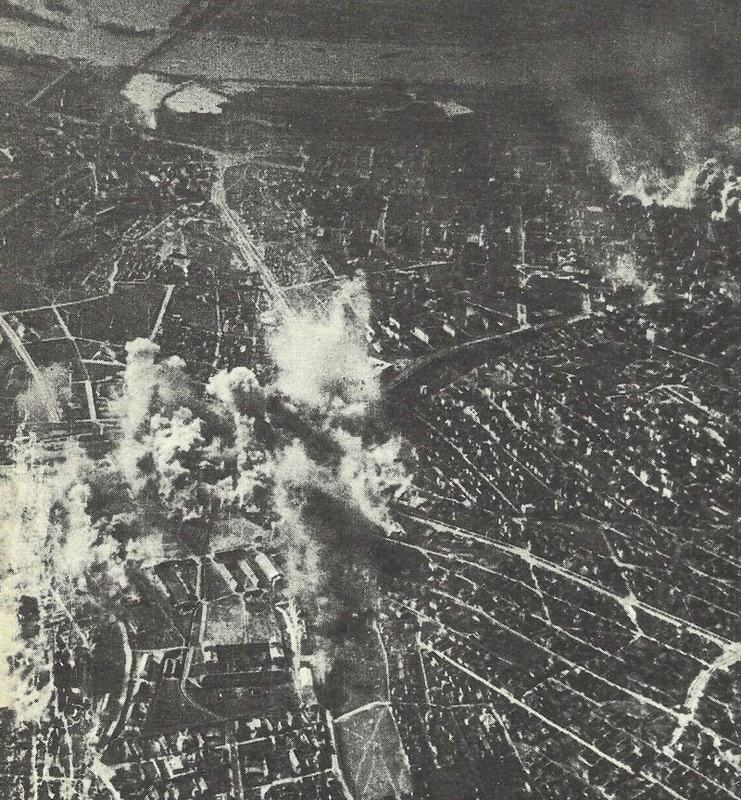 On April 6, Belgrade is hit by a devastating air strike by the 4th Luftflotte (Air Force). The coup government of Simovic becomes confused. At the same time the pincer operation of the 2nd and the 12th Army are starting. On April 17, 1941, the majority of the Yugoslav army capitulated with around 344,000 soldiers. But not inconsiderable parts are saved, led by the former Minister of War General Mihailovic in the rugged mountain forests of southern Serbia. Croatia has already made against the Serbian mobilization. Croatian troops to disobey. The hatred between Catholic Croats and Greek Orthodox Serbs is deep. The Croats, represented by the Peasants’ Party, hoping for their independence under German auspices. The young Serbian King Peter II and the government flees under British protection. Yugoslav military 343,712 ? ? ? Logically, now the German offensive with List’s 12th Army against northern Greece is following. For Greece beats the last hour, by a nation that has always enjoyed among the Greeks the greatest respect. In January 1941, also General Metaxas died, the head of the resistance against the Italians. Italy’s 28 divisions on the Albanian front still show just little activity. 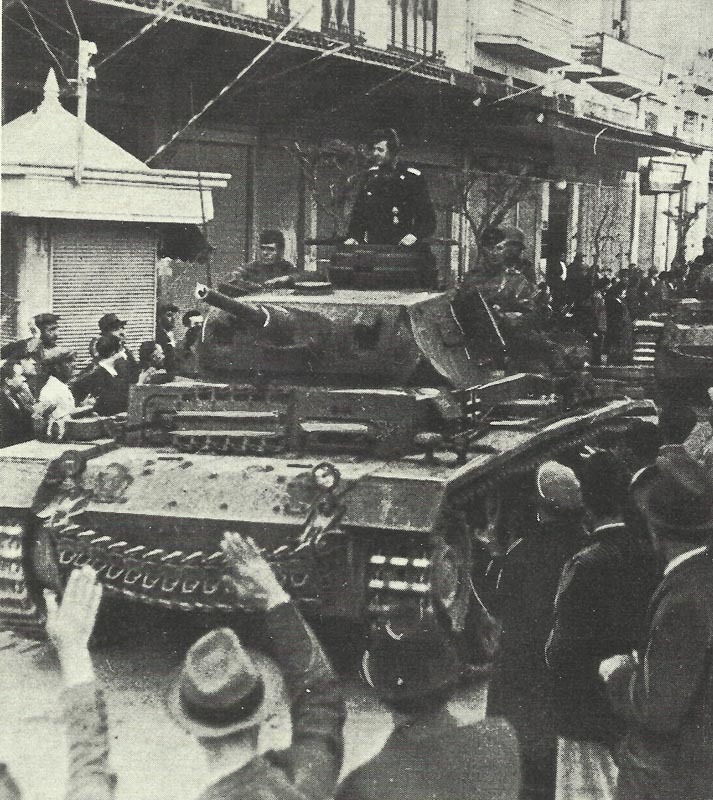 After just three days, on 9 April 1941, tanks of 2nd Panzer Division enter Salonikia. The Germans break through the Metaxas Line in Northern Greece, despite valiant resistance of the in a two-front war involved Greek Army. Already on April 9, 1941, Salonikia, the second largest city of Greece, falls in German hands. On April 21, General Tsolakoglou, the Greek commander in northern Greece, offers the surrender of his units. The German 12th Army pushes southward. For the first time, the ‘Black Guard’ of the Führer, the Waffen-SS, which forms now something like the fourth arm of the Wehrmacht, demonstrates outstanding achievements. On April 24, 1941, the breakthrough through the rear position of the British Expeditionary Force in Greece – two infantry divisions and a tank brigade – in the historically-famous Thermopylae happend. The British begin quickly with the evacuation of their expeditionary force by sea, under heavy attacks of the Luftflotte 4. The Greek king and the government fled, first to Crete, which is defended by British and New Zealand troops. Before the Greek Prime Minister Koritzis committing suicide, because he did not want to survive the downfall of the kingdom of the Greeks. 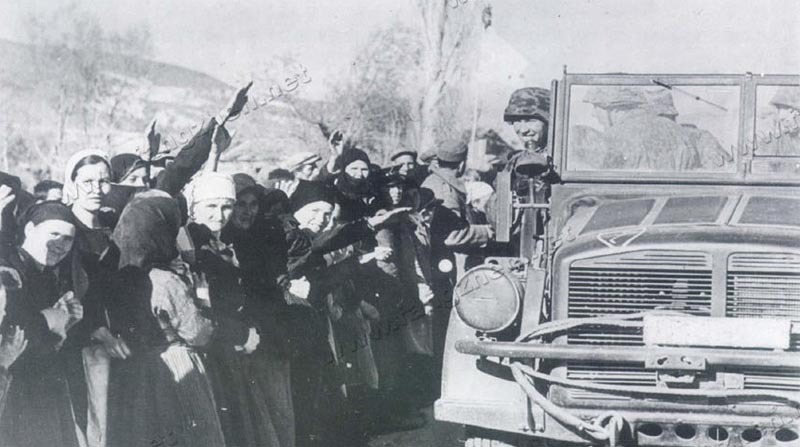 Troops of the SS-Leibstandarte division beeing greeted with obvious enthusiasm by Greek civilians, some of whom are giving the ‘German Greeting’, the ‘Heil Hitler’ salute. On April 27, 1941, troops of Field Marshal List enter Athens. Mussolini, winner of the German victory, insists on the participation of Italian troops on the Victory Parade. The SS division Leibstandarte SS Adolf Hitler, which has overcome the Thermopylae, takes over the vanguard advance south to the southern tip of the Peloponnese. On May 11, the Germans – not the Italians – are the masters of Greece and the Greek islands – except Crete. Greek Army 15,700 (incl. Missing) ? ? 218,000 ? Italian Army 13,755 25,065 50,874 – ? German Wehrmacht 1,518 – 3,360 – ? Were there alternatives to Operation Barbarossa ? Why did Hitler declare war on the US? Why Hitler attacked Russia ?